Yes. I mean The Cheese. Remember that ol’ game- the Cheese Touch? Well… it is back. Run for your lives, Poptropicans! Once The Cheese gets you, there’s nothing you can do to get rid of it. Once you’re it, you’re it for good. Unless, of course, you find someone with failing intelligence who you can pass it on to! Either that, or you lie about having the Cheese Touch, and betray your friends. Yeah, I know that’s a horrible title, but you can’t be perfect every time. So, the Creators have done two new posts. The first one is basically making fun of non-members, cause they can’t play Poptropolis Games yet. Somehow, that’s not that shocking that the Creators would do a post like that. 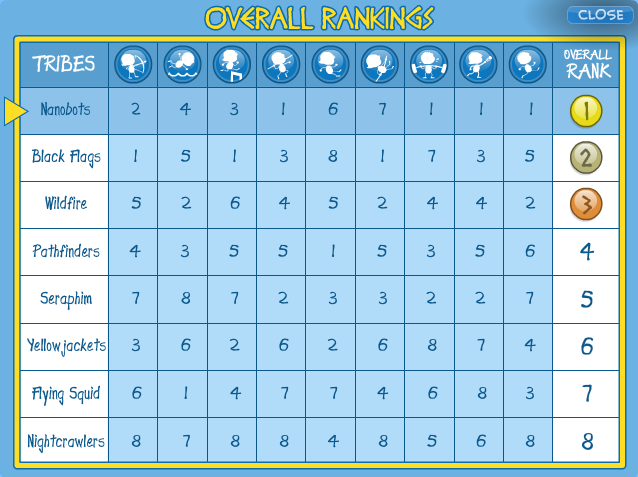 The good thing about the Poptropolis Games is that you don’t need to place first in every event in order to win the gold medallion. The winner of the Games is the one with the best overall performance, which means you can have a few clunkers and still come out on top. It’s a good thing, too! Some of these events are tough. I laid an egg on the pole vault the last time I played. Some of you may have already won the gold medallion, but has anybody out there placed first in every single event? That’s a feat we’d love to see! The second post is about the info-page for Wimpy Boardwalk and the extras that the Bearators were to lazy to put on the info-page right away. We’re making a splash to start the summer. Now, when you visit the Wimpy Boardwalk info page, you can download a new desktop wallpaper and printable poster! Oh, and sorry about posting two times in a row. I hope that it’s not a federal crime or anything.